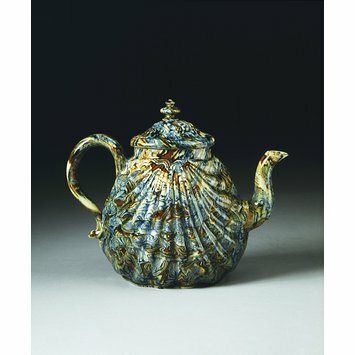 Novelty Staffordshire teapots of the mid-18th century took many forms, of which the 'pectin' shell was one of most popular. 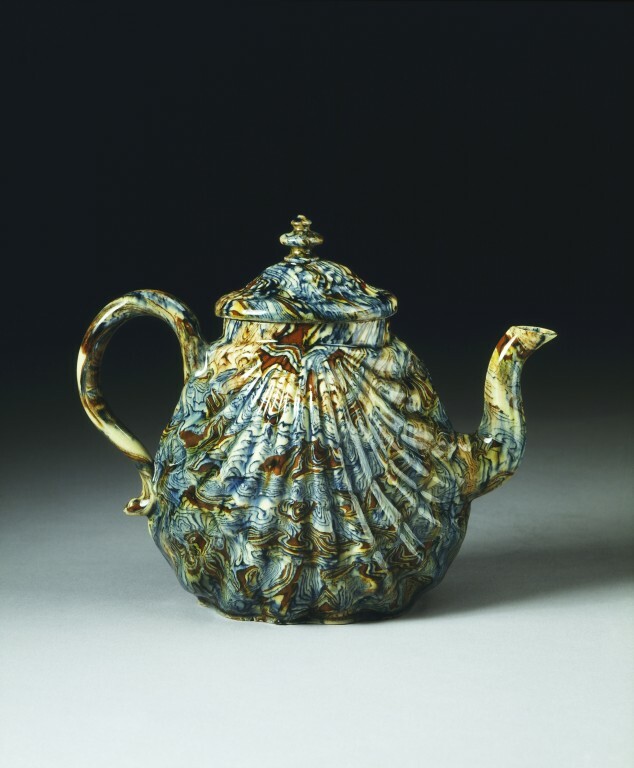 The two halves of the shell produced an ideal size of teapot, and was made in salt-glazed stoneware as well as red earthenware. Moving on from early dependence on Chinese prototypes, the potters of Staffordshire embraced elements of the Rococo style. Exotic and sophisticated hollow forms such as pectin-shell teapots could be moulded very cheaply, the limiting factor being the necessity to hide the non-matching joints. This teapot perfectly demonstrates the potters' skill and design sense, partly concealing the mould-lines beneath the handle and spout and avoiding the use of a separate foot. The appearance of so-called 'agate' ware (veined pottery intended to resemble the hardstone) varied greatly, according to the whim of the potter or the needs of the object to be made. Tight multi-coloured or simple two-colour patterns could be formed by wedging coloured clays together, cutting and rolling them like pastry. The finished sheets of clay could only be press-moulded - even globular teapots were made in two hemispheres and joined around the middle. If thrown on the wheel, like some country pottery, 'agate' clay produced a muddy spiral effect. Made in Staffordshire. Part of the Arthur James Collection bequeathed by his wife.